Threats against Trump administration officials have become deadly serious. EPA Administrator Scott Pruitt requested 24/7 security protection back in April and had to increase his security detail again in October, because of the high number of threats against him and his family. Left-wing politicians, websites and some media including The Washington Post criticized the cost of Pruitt’s security detail in light of his efforts to cut EPA’s budget. One San Francisco Chronicle columnist even attempted to justify the threats while claiming he was not advocating violence. Given the recent physical assault on Sen. Rand Paul by a neighbor and the shooting of Republican congressmen during baseball practice in June, the news media appear shockingly unconcerned about threats of violence directed at the Cabinet member. At the very least, the media should report the threats. …ABC, CBS and NBC morning and evening news programs have not reported any threats against Pruitt since he was appointed to head the Environmental Protection Agency in February. CBS This Morning did bring up Pruitt’s heavy security on Sept. 21, 2017, but only to repeat complaints from The Washington Post that it was keeping “agents from pursuing environmental crimes.” Nowhere in that segment did co-anchor Charlie Rose bother to ask why or acknowledge the threats against Pruitt which prompted higher security needs than other administrations. Co-anchor Charlie Rose read the headline of this Washington Post story critical of the security levels for the “divisive” Pruitt. 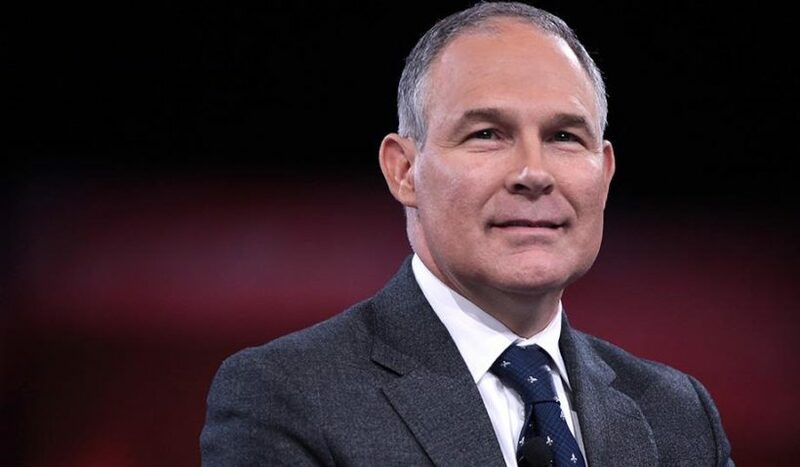 Although the Post found fault with the security, it at least acknowledged that the EPA’s Office of the Inspector General said “investigators have opened more cases this fiscal year than in fiscal 2016” and at that time 32 percent were directed at Pruitt. In contrast, CNN reported the death threats on multiple days and shows in October 2017, although most of those stories still attacked Pruitt over his policy goals. Methodology: MRC Business examined Nexis transcripts and its own video archives to review mentions of Scott Pruitt on ABC, CBS and NBC morning and evening news programming (Good Morning America, World News Tonight, This Morning, Evening News, Weekend News, Today and Nightly News) from his February appointment through Nov. 6, 2017. On November 3, while mowing his lawn, Sen. Rand Paul was attacked from behind by his next-door neighbor. Sen. Paul’s alleged assailant next-door neighbor Rene Boucher is a registered Democrat. A Facebook account that appears to be Boucher’s contains multiple anti-Trump postings. Boucher also shared posts from Occupy Democrats, a popular Facebook page for liberals and progressives. Though there were no negative comments about Sen. Paul on Boucher’s Facebook page, Boucher did write negatively about many other Republicans and the GOP in general. Sen. Paul suffered 6 broken ribs and injury to his lung. In June, a gunman attacked members at a Republican congressional baseball practice, shooting off 70 rounds at them. House Majority Whip Steve Scalise was critically wounded. Two Capitol Police officers and a House GOP aide were also shot. The gunman had a list of several Republican representatives in his pocket. The shooter had lashed out against President Trump and Republicans over social media. Rep. Scalise spent months in the hospital and is still not fully recovered. In May, a Tennessee woman who was angry that her congressman Rep. David Kustoff (R-Tenn.) voted for the Republican health-care bill in the House tried to run him off the road after he visited the University of Tennessee. What type of bias do the networks exhibit by dismissing or not reporting this information but instead criticizing the cost of the security needed by EPA administrator Scott Pruitt? “Mr. Pruitt didn’t invent these threats, and Cabinet members shouldn’t have to fear violence as a price of public service. When the federal government protects Cabinet members from those who would harm them for doing their jobs, it is protecting American democracy,” the Journal board argued. This is a serious issue: What is the media’s job? To report facts or to take sides? If a Democratic Cabinet member had received such threats–following deadly politically-motivated attacks on other Democrats–do you think ABC, CBS and NBC have published similar reports criticizing the need for security for an Obama administration cabinet head? Explain your answer. 1. Bias by story selection and spin.